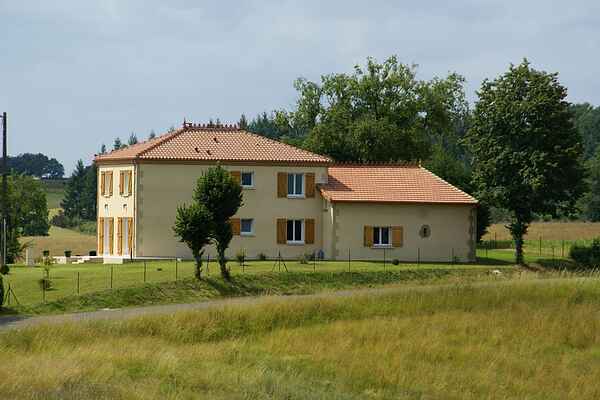 Built in 2007, this villa in traditional style is carefully renovated, and lies only 4 km away from Bassoues. It's completely detached, lies in the middle of corn, rapeseed, and sunflower fields, and has a view of the beautiful, sloping landscape. On the fenced property (2000 m²) are several barns no longer in use. In front of the house, you'll find a lovely lawn with a private swimming pool. This medieval village, full of character, is known for its old market hall and watchtower. A pond, where you can swim and fish, lies within walking distance (not an official recreational lake). In your surroundings, you will find three recreational lakes with beaches and several options for water sports (surfing, sailing, paddle boating, canoeing): Marciac (14 km), Plaisance (21 km), and Miélan (23 km). Near Tillac (17 km), you'll find an 18-hole golf course. Supermarket and marketplace in Mirande (18 km). Tennis court, bakery, and restaurant in Bassoues. There are many towns worth visiting, such as Termes d'Armagnac (28 km), with its medieval keep and beautiful view. The capital of this département is Auch (39 km). A beautiful city with a cathedral, where you can shop and relax on terraces. Treat the children to a visit to the Walibi amusement park in Agen (88 km).